Chart of accounts is simply a list of account names that a company uses in its general ledger for recording various business transactions. It provides guidance to book-keepers, accountants or other relevant persons in using specific account names while entering transactions in journal and posting them to ledger. There is no common structure or template of chart of accounts available for the use of all types of businesses. Each company prepares its own chart of accounts depending on its individual requirements. The structure of a chart of accounts is normally as complex as the business structure of the company. For example, the type and number of accounts needed by a large corporation would significantly differ from those needed by a small retailer. Similarly many accounts that are essential in manufacturing businesses are not used by merchandising companies. The type and number of accounts used in a chart of accounts depends on a number of factors such as the nature and volume of business carried on by the company, the need of internal management for making important business decisions and the need of external parties who use financial statements of the company for various purposes. The account names are listed in the chart of accounts in the same order in which they appear in company’s financial statements. 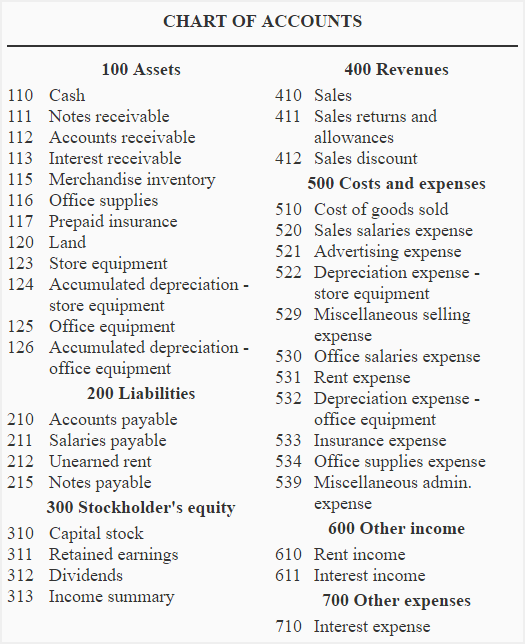 Usually, the balance sheet accounts (i.e., assets, liabilities and owner’s equity) are listed first and income statement accounts (i.e., revenue and expense) are listed later. Each account in the chart of accounts is assigned a unique number for indexing and identification. Normally each account number consists of two or more digits that tell something about the account. For example, a number starting with “1” might tell us that the account is an asset account and a number starting with “2” might tell us that the account is a liability account. Normally, appropriate gaps are provided between numbers (i.e., some numbers are left unassigned) that makes it easy to add more accounts in future without disturbing other accounts. The organizations operating in many territories with a lot of departments usually have account numbers consisting of five or more digits. The account numbers of a company with different departments and operations might have digits to reflect the department or operation to which the accounts relate. Similarly, a company operating in different territories or regions might include a digit in its account numbers to identify the territory or region to which a particular account relates. For example, the account numbers of Procter and Gamble (a multinational consumer goods company) consist of more than 30 digits to reflect different departments, operations and territories or regions. In above chart of accounts, three-digit account numbers have been used. The first digit shows the major classification of accounts, the second digit shows the sub-classification of accounts and the third digit identifies the specific account name. 1 > The account is an “asset account”. 11 >> The account is a “current asset account”. 110 >>> The account is “cash account”. 2 > The account is a “liability account”. 21 >> The account is a “current liability account”. 210 >>> The account is “accounts payable account”. In above example of chart of accounts, notice that there are gaps between some account numbers. These gaps provide flexibility for adding more accounts if needed in future.